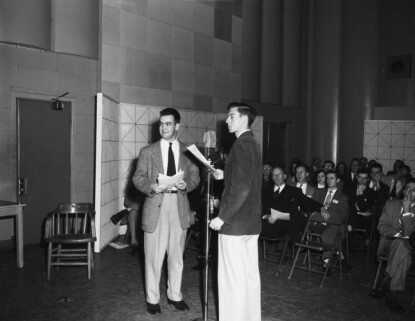 On March 13, 1953, UNC-Chapel Hill students Carl Kasell and Charles Kuralt stepped up to the microphone for WUNC’s inaugural FM broadcast. After getting its start as a student-run AM station in the 1940s, the station made its transition to the FM band with future broadcasting greats Kasell and Kuralt. The station went on a six-year hiatus in 1970, after being taken off the air by technical difficulties and returned in 1976 as a professionally-run National Public Radio affiliate. Both Kasell and Kuralt went onto distinguished careers in broadcasting. Wilmington-born Kuralt is perhaps best known for his long career with CBS, working on The CBS Evening News with Walter Cronkite and as the first anchor of CBS News Sunday Morning. Goldsboro native Kasell was the news announcer for NPR’s Morning Edition from its inception in 1979 through 2009, and was the official judge and scorekeeper on the news quiz show Wait Wait… Don’t Tell Me! from its launch in 1998 until 2014.